What floors me is how people can be so gullible in the first place. I'd like to be able to put my finger on how this happens... bad education? Religion opening up the 'supernatural' pores, leading to a belief that this stuff is possible? Trauma? Poverty? Mental illness? But from all my reading I just can't pinpoint any one thing. Gullibility, particularly to psychics / reiki masters / astrology / woo in general seems to appear at every intersection within a society. I'm blaming religion (with no data on my side - it's a hunch) but I wish there was some serious study on this because the suffering can be high, and the financial cost can be mind blowing (a friend's father with early onset dementia blew his entire life's savings on an 'over the phone' medium). There's an economic as well as social / intellectual costs. I love how you are exposing the psychics, but I also want to grab their victims by the collar, shake them and say, "What were you thinking?" I was in a vulnerable state when I was in touch with this woman. I paid for something. When I received it it was an empty bag. I emailed her and she called me a liar. 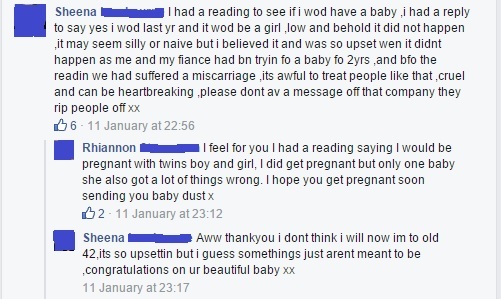 I was pregnant at the time. She accused me of trying to rip her off (for a fiver). She did eventually promise me a refund and then told me I was a liar for asking for it because she never would have. I told her her customer service was deplorable. And she said I clearly was wrong because her 150,000 follows thought differently. Well not surprised she had a bad experience. Couple of notes the 150,000 followers she has were built in a number of ways, many are fake accounts, and when she started she just offered free readings and so on, so that is always an easy way to get the numbers up. 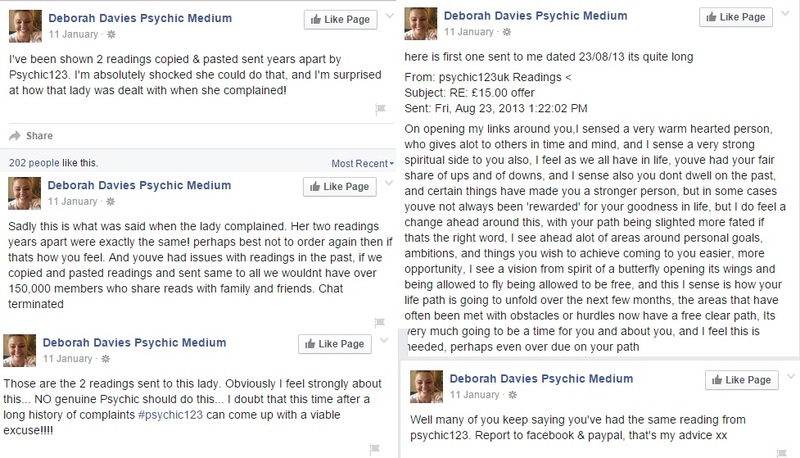 I hope your sister has learnt her lesson, and now accepts that psychics and mediums do not see the future or communicate with the dead. I hope your sister doesn't blame herself too much. If people are feeling vulnerable or desperate (particularly where things like pregnancies are concerned), then they end up trying things that they wouldn't do under normal circumstances. The person to blame here is Psychic123 for preying on these vulnerable people and messing with their emotions. 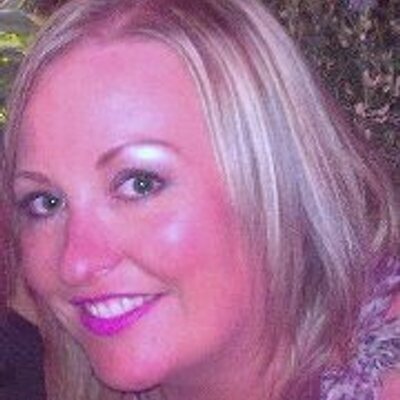 The more I hear about Gail Cuffe and her treatment of customers, the more disgusted I am by her! This evil trickster needs locking up. GAIL is a vile woman who has no heart. 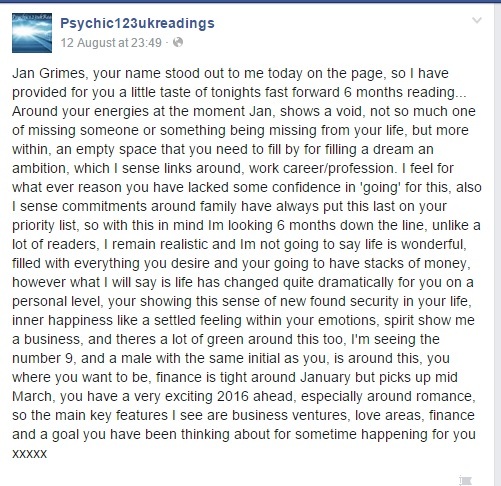 I ordered a reading and believed her hype basically I was inboxed from other members askin if I had my reading and if they could send there's as other members had recieved the same reading as her. So I agreed and word for word my reading was the same. The same spirits came through lol. I messaged her and she called myself and other members liars even tho I sent her the proof that I wasn't the only member who recieved the same message. 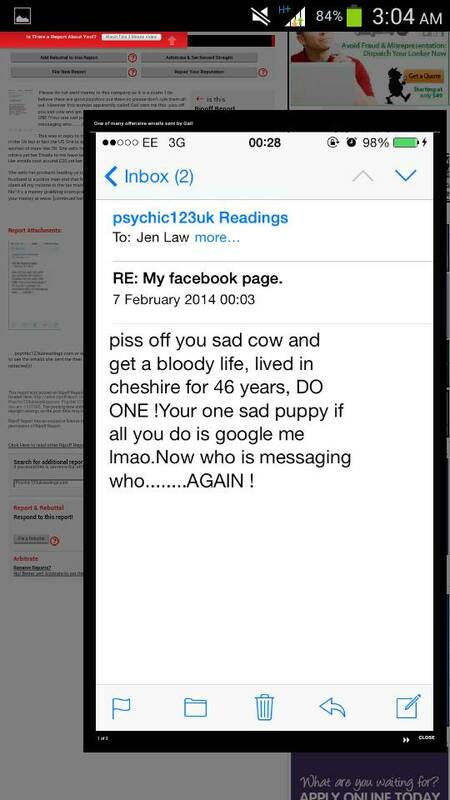 She got very aggressive and vile. She needs shutting down. Ok, so we accept this woman is a fraud, but you didn't know she was a fraud til AFTER you compared your reading with someone elses, and saw they were the same. So up until then you thought she was a legit. ALL Mediums are frauds, every single one of them, and not all of us can know the tricks, I am one of those people who does know all the tricks. So take it from me, save your money, and never waste a penny on these frauds again, at least that way you have gained from your bad experience, by learning a lesson. I have never found Gail to be rude and her points are very valid. This post is just a load of rubbish from a jealous person I am afraid. 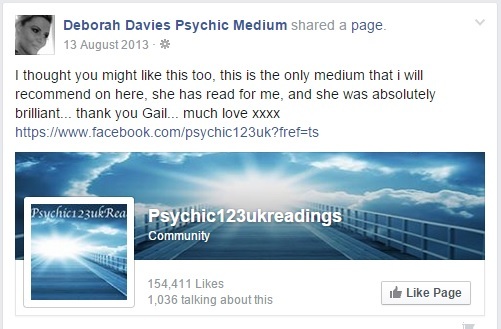 Post any reading from any psychic in the world, including Gail, and I will give you a 100% guarantee I can show you step by step how they do it, and if I cant I will close this site down. Also please understand libel laws, if I call someone a fraud, and I am lying, they can sue me. 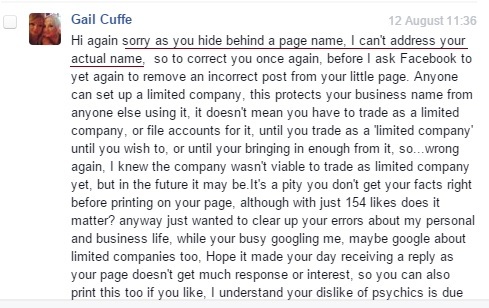 Gail Cuffe does NOT speak to the dead, it is a trick, it is in her own words "for entertainment only" If you believe she is legit, then you are a fool. Prove me wrong. Show me a reading I cant explain. Trying to translate this terrible English. 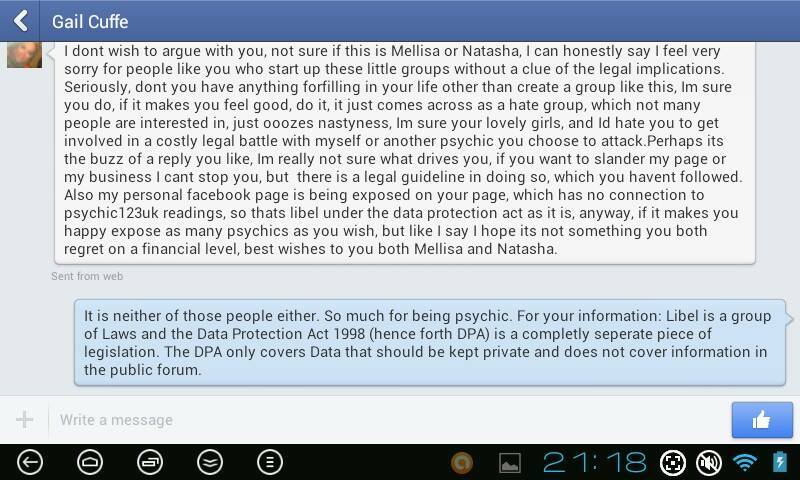 Again I am happy to back up everything I say, go to my forum, challenge me to expose ANY psychic, and if I fail, I will close the site down. I have been a skeptic and opponent of mediums and all things psychic for 30 years and while sympathetic to those who have been conned by these individuals there has always been a little part of me that just didn't understand how they could be silly enough to fall for it. That all changed in June this year.when I lost my beloved father (we were extremely close). I found myself frequently and wistfully wishing there was some kind of supernatural realm, thankfully the 30 years of skepticism was enough to bring me to my senses but it has given me a new appreciation of just how vulnerable and suggestible grief can make you. 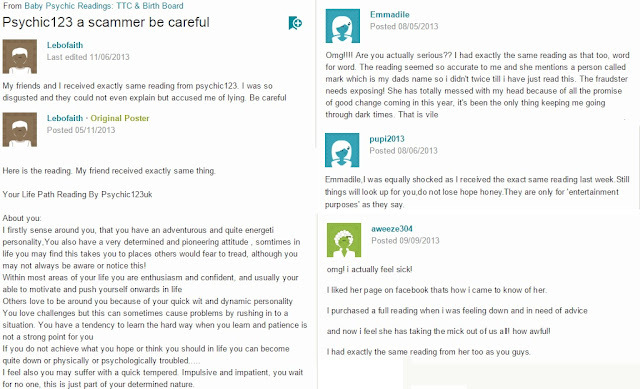 I now have not only sympathy for those conned by mediums and psychics but a sense of empathy and understanding of how it can occur which makes me appreciate what Jon and badpsychics is trying to do, its a thankless never ending task filled with abuse and constant mind numbingly boring repetition of refutation to the same old tired hackneyed arguments put forward by both the con artists themselves and their sycophantic supporters but it is vital work and I am so grateful to Jon for doing it. I am now filled with a terrible resolve to be more active and to fight this menace less passively, it is I believe insufficient that mediums and psychics can cop out with an entertainment disclaimer, like increased warnings on cigarette packaging the disclaimer should include links to proper bereavement counselling organizations and a notice specifically stating that there is no scientific evidence to support psychic phenomena or mediumship. Thanks once again Jon all the best Adrian. Thanks for the kind words of support, I appreciate them. If you ever feel the need to get things off your chest, I would be happy to consider posting an article written by you. Perhaps you could go into details of your own experiences and how the death of your father allowed you to understand better how vunerable people can become in such a position, and how despite being a skeptic of 30 years it gave you a new understanding. I think a details look at your experiences would be an interesting read. Let me know if you are interested and I will tell you how to proceed. I think Clara Belle's comment was directed toward Lisa Traber - i.e. that just because Lisa hasn't had a bad experience with Gail, it doesn't mean that nobody else has. To Lisa, I say this. Why would any of us be jealous? None of us work as psychics. In fact, we spend our time exposing psychics to try and stop them ripping off vulnerable people. Or do you think it is acceptable to take money off women who are desperate to conceive a baby, give them false hope, and then bombard them with abuse afterwards? 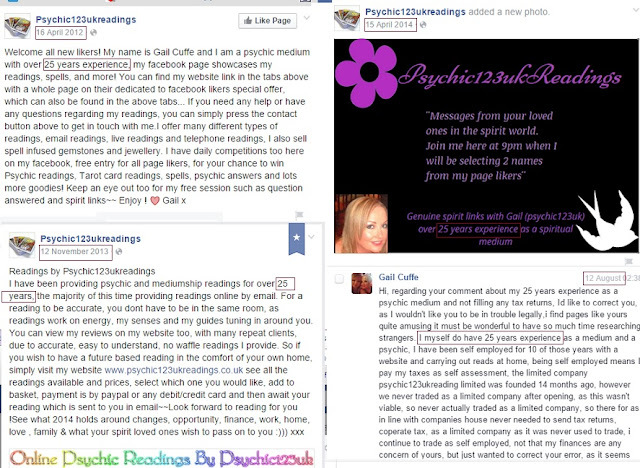 Gail Cuffe is sill ripping people off. How her page still remains on fb is amazing. Close her down! All we can do is make people awar of her scam. 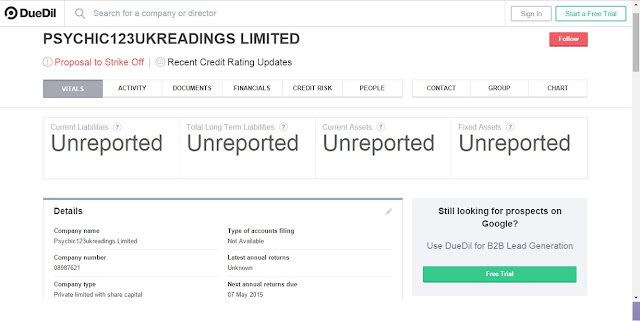 I also ordered a finance spell Halloween.feel daft now but won't be doing it again only one who gaining finance boost is Gail's bank balance by sounds of it.